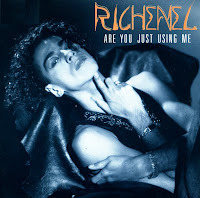 Richenel was born as Hubertus Richenel Baars in Amsterdam in 1957. He forged a career in pop music in the Netherlands. In 1986 he scored his first big hit, 'Dance around the world', which also reached the top of the charts in Italy, Germany and Scandinavia. Much was made of his 1989 single 'Are you just using me'. It was written by R. Phillips, which actually was a pseudonym for George Michael. Surprisingly, this didn't help: the single did not chart in the Netherlands - or anywhere else.